Our latest news, reports and photos on Transformation Tools acitivities are posted on our website and blogs. AND...they are all BILINGUAL! As the new year begins, I am sure everyone is wondering what the new year will bring. As I have mentioned in previous New Year messages, we are living in times of extremely rapid changes. What we are actually experiencing is faster moving energy flows. The majority of people on earth are not prepared for such rapid changing vibrations. Preparation and knowledge of life allows a person to deal with life’s changing vibrational patterns and allow them to harmonize. But, with a lack of knowledge and the rapid changes in motion, harmonization becomes difficult or impossible. This results in more and more distortion. This distortion manifests into our daily perception as confusion, chaos, frustration, loss and emotional upsets. It also makes operating in the physical world more difficult as well such as instability in one’s work, relationships, goals and purposes. The person goes from cause over his life to effect. The answer to handling the continued chaos, confusion and instability is to get trained. Knowledge and training of the basic mechanics of life will allow the individual to become cause over his life again. The first step towards becoming cause over one’s life is to understand the workings of the human mind. The mind is the most common barrier to accomplishing one’s dreams and regaining happiness. In other words regaining one’s causation over life. There are many steps down this path. But each step, done on the correct gradient, becomes easy and one can easily see his improvement and his life shift for the better. This first step, understanding and handling the aberrations of the mind that cause one to become unstable and effect of life instead of cause can be found in the book “What is Hodosology." Hodosology is the study and handling of the spirit in relationship to itself, universes and other life. The word Hodosology comes from the Greek hodos, which means “a way, road, journey, path” and the Greek word ology, meaning “study of" or "science of” thus, Hodosology means study or science of the way. The Currell Effect session is also an entrance point, which can give the participant an exterior view of the universe and life. One can experience who they are as a spiritual being. Once the participant experiences this new viewpoint, the choices he or she then makes in his everyday life is also different. Different choices make a different path and a new life! If you have never experienced the Currell Effect, I enthusiastically urge you to participate in a session. It can have life changing results. Whatever path you choose in life, what is most important is that YOU choose it. That YOU make your own choices. It is only from making your own choices that you can stop the downward spiral and the infinite loop of no change to an upward spiral that will reflect your dreams and bring you happiness and infinite joy. You have to only realize there are only really TWO intentions in anything you go into on this planet. There will be an intention to trap you or to make you smaller. And the good guys though, they will have a different one. They will have the intention to free you and make you bigger and expanding. It has been a while since I delivered a message concerning the current state of this planet and Transformation Tools activities. 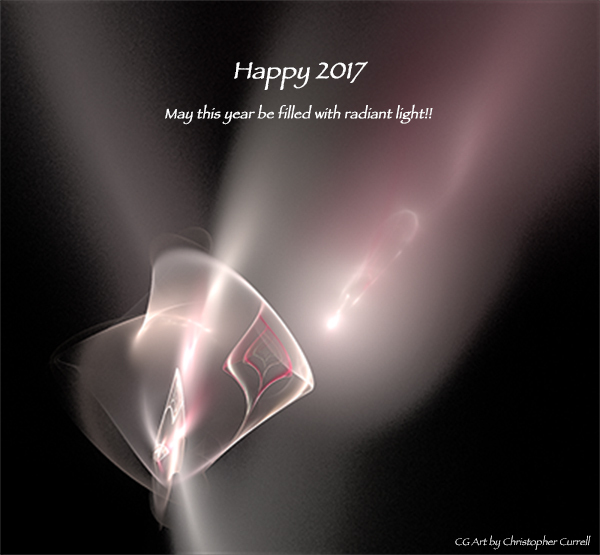 This year, 2017, has been a dramatic shift in vibration across the planet. This is evidenced in the changes in politics, the state of the environment and the collapse of social structures around the world. The vibrational patterns of each of these areas have become increasingly more distorted and chaotic. The causes of these changes are both complex yet simple when one can see through the distortion. During the Bush administration, the world started to see more overt attempts in creating a One World Order. This created a lot of upsets in the US society as well as around the world. After this upset, to create the illusion of a calming effect, the Obama administration was positioned to create the impression of a more rational and sane government. In actuality, it was a period of time for governments to actually implement, covertly, into its inner workings, the radical shifts created by the Bush administration. Currently the Trump administration's goals are to destroy all the remaining systems in society that have anything to do with the freedom, education and the environment. The goal is, in the end, to radically reduce the world population and to create a new world government that has at its core, the absolute control and suppression of rest of mankind. This includes any knowledge or education that contribute to the expansion of an individual's consciousness and awareness. Of course this includes any endeavor that uses creativity or methods of individual expression. The cause of these events on this planet is actually less than twelve men. They are members of the Bank of England and other higher financial circles. They own and control newspaper chains and media outlets. They are, oddly enough, directors in all the mental health groups in the world. They apparently, sometime in the rather distant past, had determined on a course of action. Being in control of most of the gold supplies of the planet, they entered upon a program of bringing every government to bankruptcy and under their thumb, so that no government would be able to act politically without their permission. The rest of their apparent program was to use mental health to remove from their path any political dissenters. Anyway, these fellows have gotten nearly every government in the world to owe them considerable quantities of money, through various chicaneries, and they control of course government income tax. They organized mental health groups which sprang up simultaneously all over the world, and anything that has mental health in it – in its name – or mental hygiene, or other things of that character, are all part of the organization which stems from these less than a dozen men. Through this organization, this small group controls the minds and welfare of all the people on this planet. Of course the true controllers are off planet. The energy required for all these negative changes and activities is created by generating high volumes of fear globally such as the constant threat of nuclear war. The masses are being subjected hourly by media, constant conflicting data on everything. This contributes to the escalating fear and creates chaos. People no longer know what is true and what is not true. The world is now almost 180 degrees out of phase with itself. Down statistics are rewarded while up statistics are penalized. This is a rapidly increasing downward spiral. It has reached such a momentum, that the only hope of escaping this degenerating trend is our own individual spiritual work and the persistent and unyielding search for the truth. If the truth be known, this is all a carefully designed trap to actually prevent individuals from knowing the truth about such questions as: Who am I? What am I doing here? What is my purpose of being here? Where did I come from? 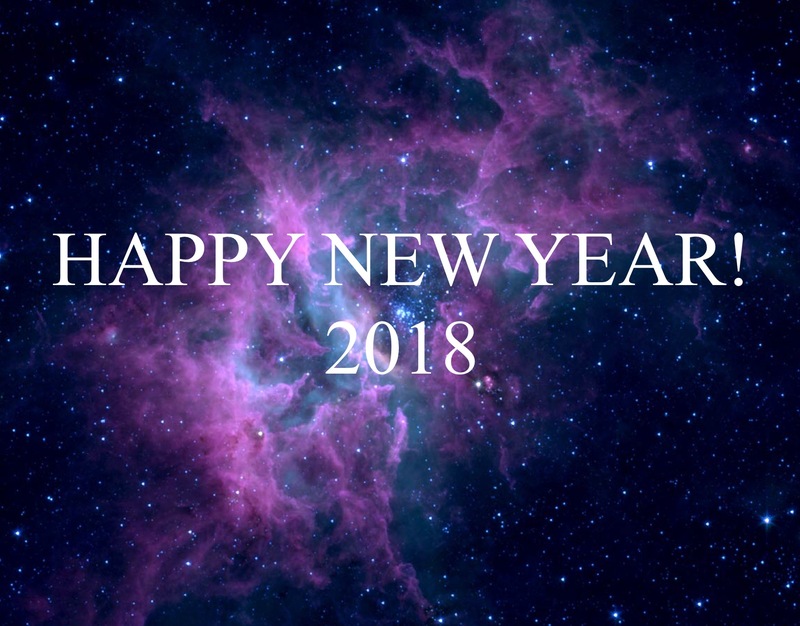 The next three years....2018, 2019 and 2020 are going to be unprecedented with the even more rapid changes, chaos and the unraveling of civilizations which will occur on this planet. A civilization without insanity, without criminals and without war, where the able can prosper and honest beings can have rights, and where Man is free to rise to greater heights. To play a better game. A game where one can have fun, wins and acceptance. To accomplish such a goal, especially in the current environment, requires a total commitment to first elevate one's own consciousness and awareness...to know absolutely that you are an immortal being. You are not your body or your mind. As many of you already know, I have spent the last seven years sharing my knowledge and information in the hope that it will be useful for people in making their life more happy, meaningful and successful. In light of the current dwindling spiral here on earth, Transformation Tools has decided to shift its goals and activities. It is time for the Transformation Tools staff to do their own spiritual work. This of course includes myself as well. With more advanced knowledge and expanded consciousness and abilities, we at Transformation Tools will be able to do more and to help others more effectively in this rapidly changing environment. Transformation Tools will begin this new adventure from the beginning of 2018 for a period of approximately three years. To do this spiritual work will require time, dedication and focus. To maximize and optimize our study time, we will be reducing our public activities. We will continue to make the Currell Effect sessions available as needed. We will continue to report our progress and findings to you via the Spiritual TV network. What is of vital importance is that all of you continue to pursue your spiritual path with as much dedication as possible. If you have as your "number one goal", of raising your awareness and consciousness...expanding your abilities. To play a bigger game. I invite you to join us on our spiritual journey. Transformation Tools may be useful in helping locate a path for you. If you feel you resonate with this message and are ready for such a commitment, please feel free to contact us from the link below for a confidential interview. Transformation Tools would like to introduce to you our path to spiritual Awakening. For many years, Christopher Currell has shared much information and his philosophy about expanding one's awareness and how to do better in Life. This data needed to be accompanied by actual processes that unburden a person's mental barriers. Unfortunately, the practical circumstances to be able to provide these processes has not been possible...till now! IT IS POSSIBLE TO KNOW ABOUT THE MIND. THE SPIRIT AND LIFE. REALLY LEARN TO KNOW ABOUT YOURSELF? If you are seriously interested in actually improving your life and expanding your awareness, Transformation Tools has provided a step by step path for you to follow which will lead you to a better more rewarding life. If this sounds interesting to you, your adventure begins here. Please click on this link to begin walking the Transformation Tools path to spiritual awakening! A channel between hyperspaces exists where scalar patterns crosstalk. Exceptionally good hyper-channels seem to be frequency dependent, and I refer to them as inter-dimensional nodal points or “Magic Windows”. Within the Magic Windows, energy from one hyperspace can be more easily collected to orthorotate into another hyperspace, since the rotational threshold is much lower. A Magic Window opens a view into other hyperspaces, dimensions, universes and other realities. There are certain conditions that exist in the universe, either randomly or periodically, in which a Magic Window may be available. When it is available and if the viewer is paying attention at that moment (elevated consciousness and awareness) he/she can perceive it. If that Magic Window opens wide enough, the viewer not only can see these other realities, but it is possible to move through the window and enter these other realities. I have determined, as of this writing, a major Magic Window will be available worldwide on February 27, 2017. This would be around 9 AM in New York, around 6 AM in LA and around 11 PM in Japan. It will be open for about 15 to 30 minutes. It was not possible to determine the exact time for the Magic Window to open so pay attention around an hour before to an hour after my posted date and time. If you are in compulsive agreement with the Earth time flow, you will probably just hang there in a daze or dreaming and not notice anything. But if you can work up enough exterior perception and disagreement, you might see something or even slide lose of this trap. It’s a good time for a jailbreak. I plan to keep my eyes open. At a minimum, it certainly can’t hurt to go around for an hour looking around and paying attention to things. ”Garden of Vis" is the third CD of the very popular Garden series. And the new third CD “Garden of Vis” is designed to be played in the background of your active environment. It can be used to create clean energy in the background of various everyday activities. It also creates a wonderful positive and harmonious vibration for the active workplace. The word “Vis” is Latin for power or force. It also implies strength, vigor, energy and virtue. 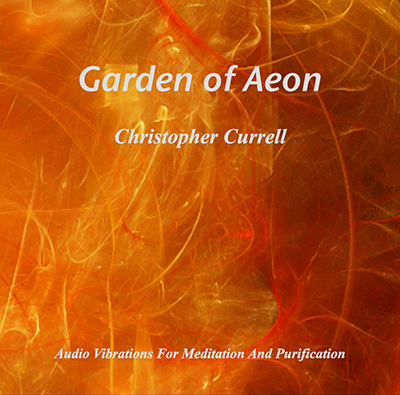 Artile on "Garden of Vis"
Article on "Garden of Zoe"
Article on "Garden of Aeon"
New Sound Session "CE-RELAX" Debut! It looks like spring is here and summer is on its way! Along with the seasons change is also an indicator of life changes as well. 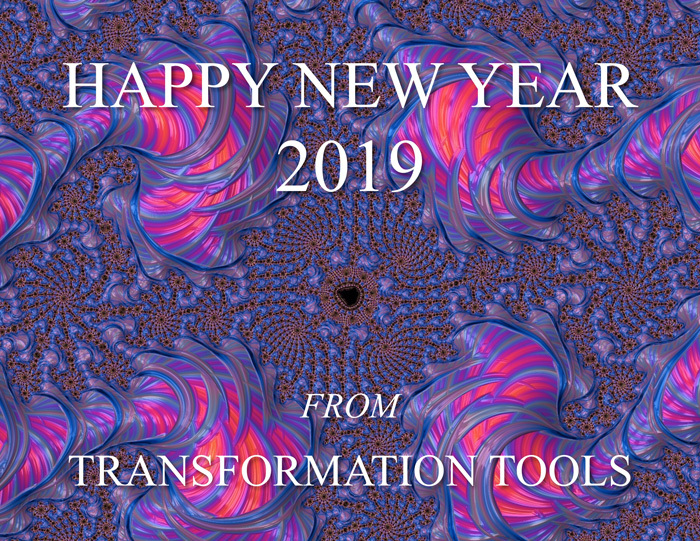 It has been a while since I delivered a message to you and with the coming of summer it is time to let you all know the new coming changes and directions of Transformation Tools. As you know, the universe is in constant change and to remain fixed is to inevitably invite more problems and difficulties rather than being successful towards one’s own activities. Of course, one does not have to change one's fundamental goals just because the universe has shifted...rather, one may have to look at more efficient paths and acknowledge new situations that have appeared or that had previously not been visible. With this in mind, I would like to inform everyone about the new activities of Transformation Tools. These subjects will be the topics of several self-help books designed to easily and effectually handle these issues in one’s life. These books will comprise a volume set, which when viewed together will give one the tools to live a better more happier life while obtaining success in one’s own goals and purposes. I will also be releasing a few new CDs. 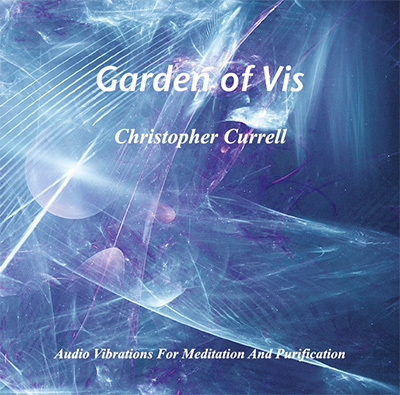 Garden of Vis - an addition to the Garden series CDs - this CD is designed to be played in the background in an active environment (such as a workplace) to energize and refresh the individual. Plenum Void - new music inspired by ishwish and the Currell Effect but focused on energizing the young at heart. Similar to ishwish but with energetic rhythms and soaring solos to move the body as well as the spirit. ishwish 4 - Metatations - A new ishwish CD artistically designed to transport the listener to different states of awareness. Transformation Tools will be continuing the Currell Effect sessions with the following change...Individuals that are interested in doing a CE session should sign up on the Transformation Tools website. CE sessions will be scheduled based upon the number of requests. The Currell Effect Practitioner Program (CEPP) will continue and CE practitioners (CEP) will be available upon individual requests. Please check the Transformation Tools website for an available practitioner near you. If you are interested in becoming a Currell Effect Practitioner, please contact Transformation Tools for information. These projects will be the focus of Transformation Tools for the next 12 to 18 months. Due to the time and dedication these projects will require, I will not be doing workshops or lectures into the near future. This coming year will be an exciting shift towards a focus that addresses people's needs to live their lives with happiness, joy and working actively towards their dreams. I look forward to serving all of you in the best and most effective way possible. Infinite possibility, Harmony and Joy! 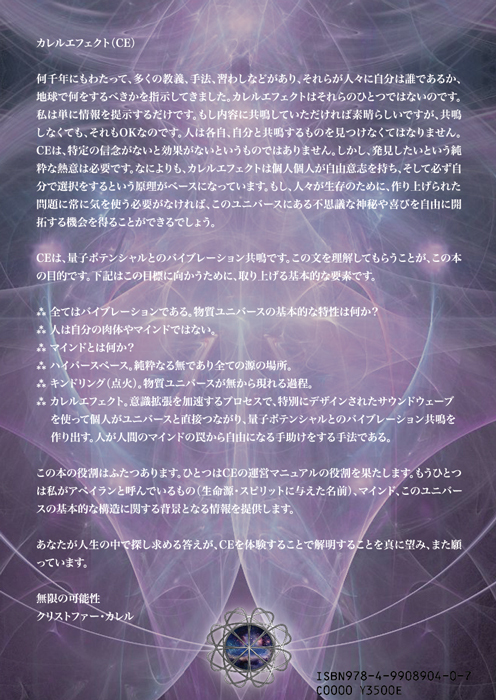 "Currell Effect ~ Harmonic Resonance Of The Quantum Potential"
at the lecture "Consciousness, Hyperspace and the Currell Effect"
For thousands of years, man has experienced the power of sound vibration. Starting with beating sticks on logs and uttering vocal nuances, primitive man has always felt the effects of sound. It is universally understood that music (controlled sound) can effect a person's emotions...making him feel happy or sad. It can make a person's body move. Sound can also create mental images in the mind. Sound can inspire a person to new thinking or creativity. These are but a few of the amazing things that sound can initiate in a human being. In fact, these things are so well known that we take them for granted as part of life. We cannot imagine a world without sound and music. Yet, what is interesting is scientists have no idea HOW these experiences actually manifest while listening to sound or music. What is sound? Sound is air (a gas) that is vibrating. How is it possible that just moving air can create these effects in a human being? Vibrations of air travel to the ear where they hit the eardrum and then turned into electrical impulses in the brain. Moving air by itself cannot create these physical or emotional effects in a human being. Clearly there is more going on that is not readily observable. 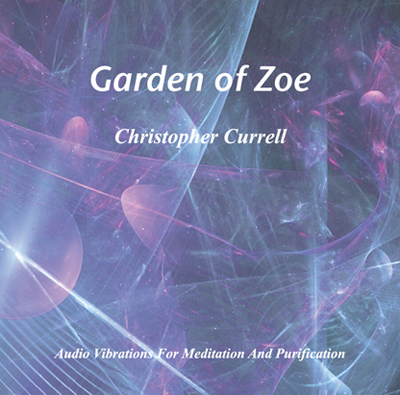 In his new book, the Currell Effect, Harmonic Resonance of the Quantum Potential, Christopher Currell reveals and explains for the first time, using physics and quantum mechanics, the complex interactions of sound and their effects on the human mind. If you are interested in sound, music, the mind and science, you will discover for the first time how and why sound creates such wonderful experiences in human consciousness and human experience. Currently Japanese version only. English version is coming soon! 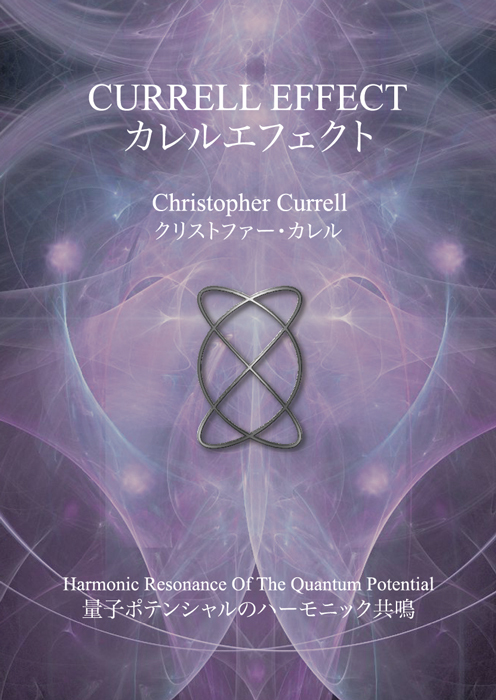 Buy and read the "Currell Effect - Harmonic Resonance of the Quantum Potential"! 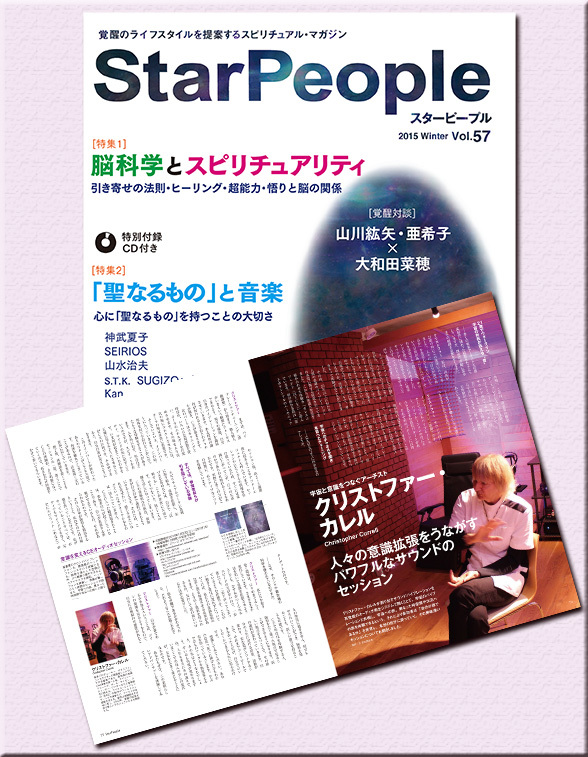 Christopher’s interview is published from the “StarPeople” magazine, 2015 Winter Vol. 57 issue!! The interview took place during the Currell Effect in October. The pages are beautiful! It is a well written comprehensive article on the Currell Effect. Magazine is now on sale. The CE Practitioner Program (CEPP) started this August and the Currell Effect has once again entered into a new phase! CEPs are independent practitioners, who has completed the training course provided by Transformation Tools (TT). These certified CEPs can now provide CE sessions using portable high-quality CE playback system. The CEP training courses were held in Aug. and Nov. We now have CEPs throughout Japan; Tokyo, Saitama, Kanagawa, Aichi and Osaka, Shiga and Okinawa! Transformation Tools profides various tools to support CEP's activities, such as CEP Profile web pages, online forums, Christopher’s book “Currell Effect – Harmonic Resonance Of The Quantum Potential” (Japanese version), CEP kits (CE playback system), etc. CEP program is very important for the Transformation Tools. Up until now, we were the only ones who could give CE sessions, but the certified CEPs can now provide CE sessions! One of the goals for Transformation Tools is to provide tools that help promote people to become more aware and expand their consciousness by having larger viewpoints. And the most powerful tool is the Currell Effect. By having more CEPs, we are able to make a big step forward toward this goal. This is a very exciting thing for us! Once a gain, a new adventure begins! The more powerful and refined Currell Effect made its debut in March 2015, and it is now standardized. We also had CE sessions at a wonderful venue, which has become our Tokyo base for the CE sessions in June and October. This standardized CE is designed to connect with the spirit on more fundamental frequencies, thereby becoming more effective (better communication, resonance and reality). “The journey ultimately begins and ends with you. The Currell Effect helps expand people’s consciousness using sound vibration. The new CE, which is more powerful and more refined, will begin at the end of March (Mar. 27 to 30)! As mentioned in the “Transformation Tools – Projects for 2015,” to ensure that the participants get the optimum gains possible from CE, Christopher has revised the content and advanced the delivery of CE. Thanks to the advancement in technology, we are now able to provide the CE session at more affordable price. This is accomplished by using a high quality yet portable headphone system, which provides the quality necessary to invoke the CE process. We will also begin the CE Practitioners Program this summer, which allows easier delivery of the CE process throughout Japan by other trained CE practitioners. As the first step of initiating the CE Practitioners program, TT will present a CE pilot program at the end of March. The purpose for the pilot program is to provide a new more focused CE with a new audio system, and also to conduct a short survey concerning the CE Practitioners Program. Due to the lowered cost of the audio playback system, TT will be able to provide the new CE session for a very affordable price, which is about 1/3 of the CEX session. If you are interested in becoming a CE Practitioner, we highly recommend you to come to the new CE with the new portable audio system so you may experience what the CE practitioner will be able to provide to participants. Only two people per session. Seats are limited and they are starting to fill up. An early reservation is recommended. Please see more details on many exciting projects including this coming CE Pilot Project on the TT website! Please contact tt_office@ishwish.net for details on CE. This year will be very exciting as we expand into new areas that can help people expand their consciousness and improve their lives. Beginning in March this year, we will be presenting a new, more streamlined CE process. This new CE is a result of much feedback by CE participants. Everything is a vibration. If we wish to understand the universe around us we must be able to communicate. We must also have a resonance (affinity) with the thing we are trying to understand. One more aspect that is required for understanding is reality. Resonance, Reality and Communication are the required elements that make up understanding. But also realize, each one of those things are an interaction of vibration. Understanding is a gradient process that results in the expansion of consciousness and awareness. CE fundamentally and directly interacts with the spirit on a vibrational level. The new CE is designed to connect with the spirit on more fundamental frequencies than the previous CEX thereby becoming more effective (better communication, resonance and reality). Everyone views their universe differently, that means each person has a different reality, resonance and communication with their environment. The new CE program will be presented in gradients. Eventually there will be nine levels of CE. Each designed to connect with an individual on a different frequency (awareness level). Also, like any new technology, the initial cost is expensive, but as various relevant and new technologies begin to become available, the cost inevitably drops. And that is good news for people interested in CE because the audio hardware technology has been reduced in cost without compromising the CE process. Beginning with the new CE pilot program at the end of March, the cost of a CE session will be reduced by 65 percent. It has always been my goal to make available the CE technology to everyone. This year will be a great step in that direction. Also, the first book on CE will be available this summer. It is called "The Harmonic Resonance of the Quantum Potential - A Handbook for Understanding the Currell Effect." Everything a participant needs to know and more will be presented in this book. The first edition will be in Japanese followed by the English version. I am very excited about this streamlining and expansion of CE. Please check the TT website for more updates and information. Due to our intense focus on delivering the new CE, we will be suspending all workshops for the remainder of 2015. If you have an interest in the fundamentals of how the universe works, I suggest you attend the LOW1 workshop in February. It is loaded with information...a quick start guide...of the things you need to know to operate efficiently in this universe. LOW1 will be the last workshop till 2016. I want to thank you all for you wonderful support! 2015 will be a year of change. Included in this change are many Transformation Tools (TT) projects. We are advancing every day toward bringing more tools to help you with your advancement towards greater consciousness and awareness. The following is a preview of things to come for TT in 2015! Currently, to facilitate in this expansion, TT is looking for a permanent office space in Tokyo. We have increased the TT staff to facilitate expansion. The first big change that will be coming will be with The Currell Effect (CE). To insure that you get the optimum gains possible from CE, I have revised the content and advanced the delivery of CE. A CE book is coming! It will be called "Harmonic Resonance of the Quantum Potential - The Book of Basics for the Currell Effect." It will contain all the information needed to understand and use CE correctly and optimally. The name CEX will go away...there will only be CE. The CEX label was intended only to temporarily differentiate CE v2 from the ultimate CE released last year. Now that we have moved forward significantly, we will use the original term, CE. To begin implementing the new changes in CE, TT will begin by presenting a pilot program from Mar. 27 to 30. This will be called the CE Pilot Program. Previously, CEX could only be presented by using a custom developed $25,000 audio system. The quality of the CE audio is so high that it cannot be reproduced on a standard CD or audio player. Due to its cost, we were only able to deliver CEX to a maximum of two people at once. Also, because the audio system is very delicate, shipping the system is very difficult and expensive so we could only deliver CEX in Tokyo. In addition, because of the expense of research and equipment, the cost to the participant is high. It has always been my intention to make CE easily available to everyone. So one can see the limitations the current CEX is in this regard. But good news! Technology has moved forward! Now there is available, a portable and affordable headphone player and headphone with the quality necessary to invoke the CE process! The CE practitioners program will make available trained practitioners that can easily deliver CE. A CE practitioner will have their own portable CE playback system and can deliver the CE process easily to anyone who wishes to do it. The goal of TT is to have many CE practitioners throughout Japan and then throughout the world. A CE practitioner is independent. They are not directly associated with TT and are free to integrate the CE practitioners program into their own business. TT will provide an Internet web presence to help answer questions for the practitioners. Each practitioner will have their own web page on the TT website for promotional purposes. There will also be a forum for participants to ask questions to practitioners or TT staff. Each CE practitioner will be trained and certified by TT to ensure that the CE participants are getting expert service and delivery. This program will make CE available at affordable prices. If you are interested in the CE practitioners program, please contact TT Office for more detailed information. Also, I highly recommend you to sign up for the pilot CE sessions at the end of March. You will experience the new CE material and portable playback system. In addition to the normal CE participants feedback, there will be a simple survey about the CE practitioners program for you to fill out. 2015 is the year of major change and in accordance with this change, TT is busy at work developing tools and making them easily available to everyone. The vibrations in the universe are speeding up radically. To keep up with this rapid motion and change, we need to accelerate our rate and quality of spiritual consciousness expansion. Please join us in this wonderful new adventure. Find out who you are and regain your confidence and abilities to create your dreams! I would like to announce our newest addition to the Transformation Tools staff, Yuuka Arai! Yuuka will be performing a key role in the expansion of Transformation Tools as well as assisting in bringing Transformation Tools products and services to you. Please welcome Yuuka to the Transformation Tools staff! We also started a "TTFA-CEX" program. If you refer CEX and 10 people sign up, you get one free CEX session. I would just like to inform everyone of the latest news and updates here at Transformation Tools. We are planning on doing CEX in September. If you are interested in attending, please check the TT website. The last CEX was totally full a month and a half before the event. I don't want any of you to miss out. We are also planning a workshop. Some people have asked for the Communication workshop/CEX Prep Course and some have requested the Life Orientation Workshop. So we decided to post a page where people that are interested in attending can request their preference. If we can get enough people interested in attending, we will do the workshop that is most requested. Since we are planning another CEX in December, we can do the second most requested workshop at that time. Please look for the workshop interest page on the TT website. It should be up soon. Masayo Ikeuchi, in charge of Transformation Tools Office has moved on to more fully realize her mission. We would like to thank her for her wonderful contributions in expanding CEX and Transformation Tools. We wish her the best with her future endeavors. There has been interest from some of you about teaching the workshops and my information. At this time there is no official or qualified individuals that can teach a TT workshop or my information. I have not really thought about this very much at this time since we here at TT are trying to get all twelve workshops assembled and ready to be delivered. This and CEX has been taking all our time and attention. However, in the future, I may revisit this subject and possibly create a supervisor course that would qualify an individual to supervise (teach) the TT workshops. Let me know your interest in this. This sums up the current news. I hope to see all of you in September at the workshop and at CEX. Welcome to Transformation Tools Portal Site! We are very excited to announce our new project. All of Christopher's activities come together under the Transformation Tools or TT. Christopher's goal has always been to expand and raise people's consciousness. TT will be the place where we introduce various tools for consciousness expansion and transformation. We look forward to seeing you in one of our TT projects.